In a world where digital readiness is becoming not only a key to success but a requirement for survival, European insurers and other financial services firms excel in two key areas: strategic thinking and customer-facing initiatives. According to a new Accenture study, which examined 27 insurers and 26 banks in five countries, European banks and insurance firms scored an average of 2.5 points on a scale of 1 to 4 on the digital customer experience. 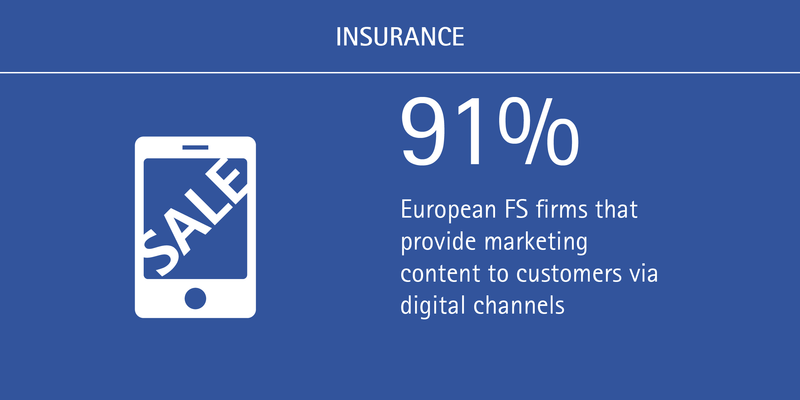 The study found that a vast majority of European financial services firms already provide marketing content to customers via digital channels. However, only a little more than half of the insurers and banks examined for the study use browsing history to target content. The study found that firms in France, Germany and the United Kingdom did better in serving digital customers. But there are still companies in Italy and Spain making innovative advances. For example, Italian bank Intesa Sanpaolo won Efma’s Physical Distribution award for its paperless branch model in 2015. The model digitally produces and stores the bank’s paper documents, minimizes customers’ paper documents, reduces storage costs and enables digital signatures. When the paperless branches were launched, customers were highly impressed with the leap into high tech—even though the change was not that significant for the bank, as it had already been upgrading its processes to go paperless. To stay relevant with customers, financial services companies need to find a way to be at the frontline of the experience rather than be an additional step. An auto-insurance company could provide real-time quotes as a potential car buyer looks at different models, then connect to a bank, which could offer a two-click car loan. As more digital disruptors look to take banks and insurers out of the transaction, remaining connected requires compelling offers, loyalty programs and other incentives for digital customers. As customers change behaviors and competition gets fiercer, banks and insurance companies need to be thoughtful about the role they want to play in the evolving marketplace. New revenue pools will replace existing ones with a likely emphasis on service fees, which will create the need for appropriate cost structures. Operating models will become more focused on service level agreements, and firms will start to feel more like technology companies in their skills and focus than the high-touch companies of old. Each organization should map out its own digital transformation course, as cookie-cutter approaches will not facilitate differentiation, crucial to long term viability. To learn more, register to download the report: European Financial Services Digital Readiness Report.